There are a few things that I do every morning on a routine that I would say are just normal hygienic practices. I shower, brush my teeth, and I put on deodorant. I’m pretty picky about the way I smell. However, I also have very sensitive skin. Because of this, I have had to do a lot of shopping around when it comes to my deodorant. Natural deodorant has really been a life saver when it comes to smelling fresh all day long without absolutely destroying the skin under my arms. There are, a lot of options when it comes to natural deodorant, so I’m going to try and give you some of the pros and cons of different types, and tell you which ones I like the most. Store bought, non-natural deodorant is bad for you. If you aren’t using natural deodorant, you should really consider changing the deodorant you apply every day. Studies have shown that store bought deodorant is just not good for you. It contains harmful chemicals such as aluminum chlorohydrates, triclosan, (a pesticide), and parabens. Putting these chemicals on your skin can be even more detrimental than eating them, because they enter your bloodstream without getting filtered. On top of all that, the chemicals are really damaging to skin. If you find yourself with a skin irritation under your arms, it just might be your deodorant. On the flip side, natural deodorants are extremely effective without using any chemicals to try and hide the odor. Instead, natural products often rejuvenate your skin and keep your underarms fresh! There are so many options when it comes to natural deodorant, but it might take a couple extra steps to get the deodorant that works for you. This article should help you identify which product could be best for you. There are tons of different options when it comes to selecting which type of natural deodorant is going to best suit your lifestyle. There are some that are extremely similar to standard deodorants, and some that will give you a great new experience. Hopefully some of the information in the following sections can help you identify which natural deodorant choice is best for you. As far as natural deodorants go, the one that has worked the best for me is the cream deodorant. My under arms get particularly dry in the winter, so cream deodorants allowed me the natural way to stay fresh, and also moisturize my skin. I personally used one based in coconut oil and infused with several different other essential oils, but there are tons of different options. While I do not use antiperspirant deodorants of any kind, many of the creams also contain factors to help prevent sweating such as natural clays or baking soda. The downside to this deodorant is probably the fact that it feels pretty weird to apply, almost like applying lotion to your armpit. When it comes to natural deodorants, I like my pits to feel natural, and these creams can feel heavy up in there. It can also be a slow process to apply, and that may take a good amount of time away from your morning routine. Now if you want to save time, spray deodorant is the right choice for you. If I wake up late and am in a rush, sometimes I straight up just forget to apply deodorant. Gross, I know, but spray deodorant is a pretty quick and easy fix for that. It is able to be applied really quickly and effortlessly and it freshens your pits right up. Most often natural deodorant sprays contain ingredients like essential oils, aloe vera juice, or juice from other natural plants, but sometimes spray natural deodorant also contains alcohol. Spray deodorants don’t really contain any antiperspirants however, so they might be a little too lightweight for some people. If you are worried about sweating, sprays won’t stop it. But if you aren’t worried about it, spray may be just the right choice for you. Side note, when applying any alcohol-based deodorant, be patient and don’t put it on right after shaving unless you want a really unpleasant burning sensation. When I lived in a really humid environment, I needed a natural deodorant that would last all day and keep me fresh. A mineral stick was a great choice for me because I was trying to avoid strong smells, but not have body odor. This natural mineral deodorant stick really works. It is extremely effective at neutralizing your body odor, however, there are downsides. These natural deodorants don’t absorb your sweat, and they are primarily salt, so they can really irritate your skin. Another problem is that sometimes companies add aluminum alum to their mineral sticks, so that isn’t what you want if you are going for a natural deodorant, do your research and find a mineral deodorant that is truly natural. Natural deodorant powders are the original natural deodorant. It can be purchased with essential oils added or as a mixture of several different powders. One of the great things about natural powder deodorants is you can make them yourself really easily. By simply looking up a few recipes, you can mix powders and make a deodorant that you know all the ingredients of. However, it can really be a pain to wear if you are a heavy sweater. The powders can get clumpy and kind of gross. They also just don’t really stop the odor that much once it reaches that point. Another problem is that the powder is messy. It can get all over the place if you don’t’ apply it carefully. Put it on before you put on your clothes. If you are just making the transition to natural deodorants, stick deodorant is probably your best choice. It is very similar to chemical ridden deodorants. They are usually made of natural oils and butters like Shea butter or coconut oils. 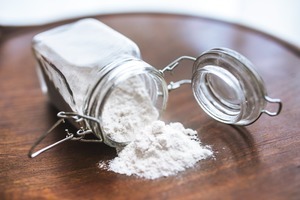 Cornstarch or arrowroot powders serve as antiperspirants in the stick, and then essential oils are there for scent and antibacterial purposes. These work great, but they are often really strong smells. Make sure you make yourself familiar with them so that you know which one you prefer. If you are like me and don’t like antiperspirant, there are many options that don’t include antiperspirant ingredients that will really appeal to you. This also helps remove any skin irritants. A few things to remember when you are considering which natural deodorant you should use, try a few options. They are all great alternatives to the chemical laden deodorants that really work! Keep in mind that the body naturally adapts to any deodorant that you use constantly over time, so it is a good idea to keep mixing it up. That way your body doesn’t gain a resistance to the odor fighting ingredients in your deodorants. Use what works best for you, but don’t be afraid to branch out and try something new.